You will need to share files between Android, iPhone or a PC at a point in time. Sometimes it’s a photo, sometimes it’s a song, and many other times it’s some sort of document, presentation, or other files that need to be shared. In our last how-to guide, we discussed how to get premium Android apps for free using Blackmart Alpha. There was a time when the only way you could share files between your Android device and a Windows computer was by using a USB cable (and back again). The HomeGroup option in Windows is a great way to share files and printers between PCs you have on your home network—but it doesn’t support mobile devices. One option to share files between devices is SHAREit, a powerful Android app. SHAREit helps you manage the files on your Android device. SHAREit App allows you to easily send media files like images, videos and docs with super fast speed. And there is no file size limit means you can send file as small as 1MB and as big as 10GB. Using SHAREit app, no worries about old technology like USB Wire Transfer and Bluetooth because this wonderful app works on the latest technology of Wi-Fi Direct connect which enables it to transfer files between devices within matter of seconds. SHAREit app is available for all Windows PC, Android, Apple devices like iPhone, iPad and Macbook and its completely free. Once app is running, you can find any other person, who is also having the same app, and can begin with the file sharing things. 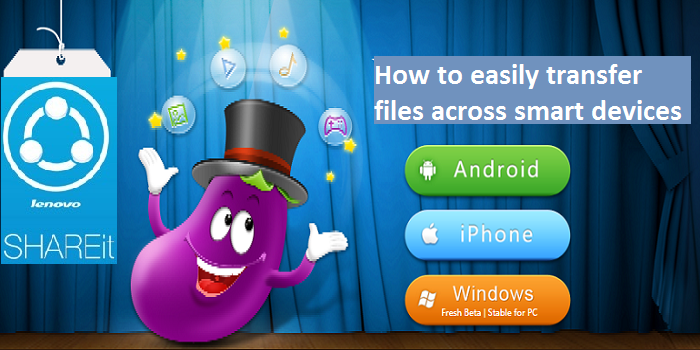 You can share the complete file, or folders and that too instantly. The app uses Wi-Fi Direct technology which is safe, because it creates a private connection between the two devices. Start the SHAREit App from the start menu or from shortcut icon created on desktop. Yes, unlike other apps this mind blowing application is available for iOS uses so that you can download this app for iPhone or even iPad. Not only you can share images, videos or any type files with fellow iPhone users but you can even send the same to Android users and to PC also.